Tonight’s lesson continued work on Filipino influenced martial arts tactics in sport and self-defence. 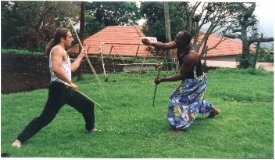 Although we did train through postures and opened up sparring to all ranges, we primarily focused on stand-up fighting. Next week we will move more into clinch and ground. The lesson began with a warm-up of single and double-stick movements. We started with the single stick 12 angles. This then moved onto double-stick partner work. Here we used angles 1 and 2 through postures before using angle 1 and 9 for v-step isolation work whilst transitioning from combat base to standing. Finally we finished this section with angles 1 and 2 with freestyle footwork. The main point of these exercises was to encourage freer transitioning and footwork as the main concentration focused on using the sticks. We then completed 8 x 2 minute rounds of specific and progressive sparring emphasising attributes taken from the stick-work. This began with pitting typical western boxing against the angles trained using the sticks. Typically we used the angle 1/angle 2 single arm combinations against jab/crosses. This later developed into trapping. Later we integrated techniques into stand-up MMA with head cages to encourage elbow strikes. Finally we changed to normal MMA sparring.